Philippa Thompson, violin; Leanne Darling, violin; Jana Andevska, violin; Lev Zhurbin, viola; Jessica Pavone, viola; Loren Dempster, cello; Gil Selinger, cello; Audrey Chen, cello; Terence Murren, bass; Todd Nicholson, bass; Natacha Diels, flute; Leah Paul, flute; Jecca Barry, flute; Nate Wooley, trumpet; Sam Hoyt, trumpet; Charles Waters, clarinet; Christopher Meeder, tuba; Mary Halvorsen, guitar; Tatsuya Nakatani, percussion; Assif Tsahar, conductor. Recorded at BPM Williamsburg, NY on 11/12 June 2004. 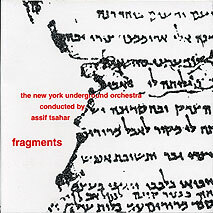 Front cover design (reproduced above) by Assif Tsahar.